GET SKILLED = this program offers students the opportunity to participate in all the learning sessions together with activities, discussions and research to best develop their knowledge & skills in a Leadership and Management capacity. You have the option to complete some assessments and get feedback to reinforce your learning. 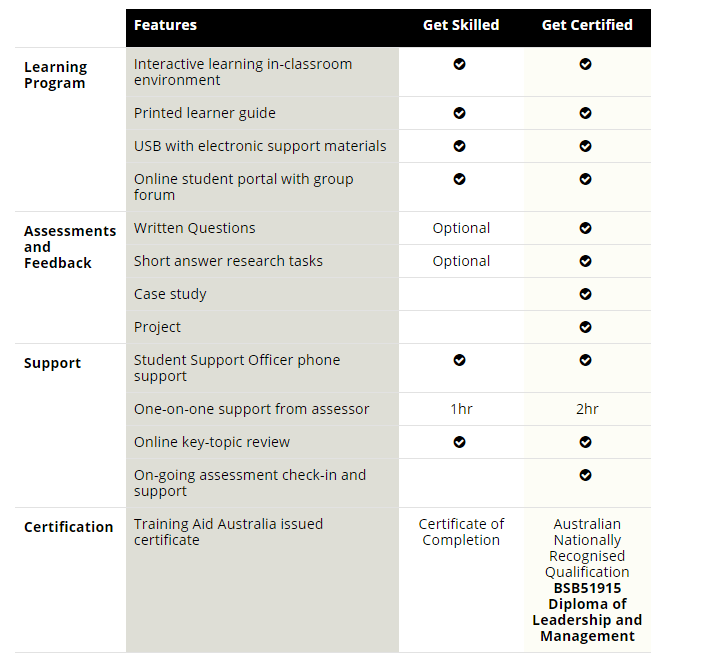 At the end of your learning program, you’ll be issued with a Training Aid Australia GET SKILLED Certificate of Completion. GET CERTIFIED = this program includes all the “GET SKILLED” components, then has added assessments for the opportunity to obtain an Australian Nationally Recognised Qualification – BSB51915 Diploma of Leadership and Management. The six half day Leadership & Management Level 2 sessions are conducted from 3pm until 7pm. This course takes up to 24 months to complete successfully. Please contact us using the below contact form to make an enquiry or call us on 02 1300 663 350. The below table covers the Leadership & Management Level 2 program topics and the subject areas which we will cover in the six sessions. This course is suitable for people who apply knowledge, practical skills and experience in leadership and management across a range of enterprise and industry contexts. If you fill in the form below, we will email you the Certificate in Leadership Management Description.